I was checking out the White Shield page on Facebook the other day (if you haven't run across the White Shield on Facebook, it's always worth visiting if you have an interest in heraldry and heraldic art), and ran across this posting. I will admit, I am flattered by the praise. I don't know how much I deserve it, but I learned a very long time ago that a person is not the best judge of his or her own works. 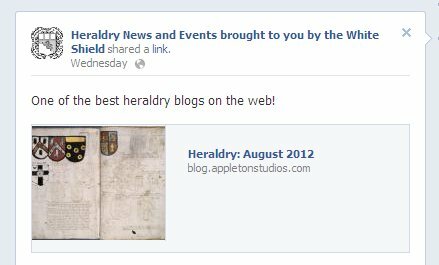 And I do try to have interesting and/or informative content on this blog, but with all of the other really good heraldic blogs out there, well, again, I'm not the best judge of my own work as compared to that of others. So, thank you for the accolade. I will try to be worthy of it.